If you’re sick of those spider veins and red growths on your body, we’ve got a solution for you. We know that spider veins can be an unsightly nuisance, and we understand how important it is to look good and feel good. If you’re looking for expert and effective spider vein treatment, you’ve come to the right place. 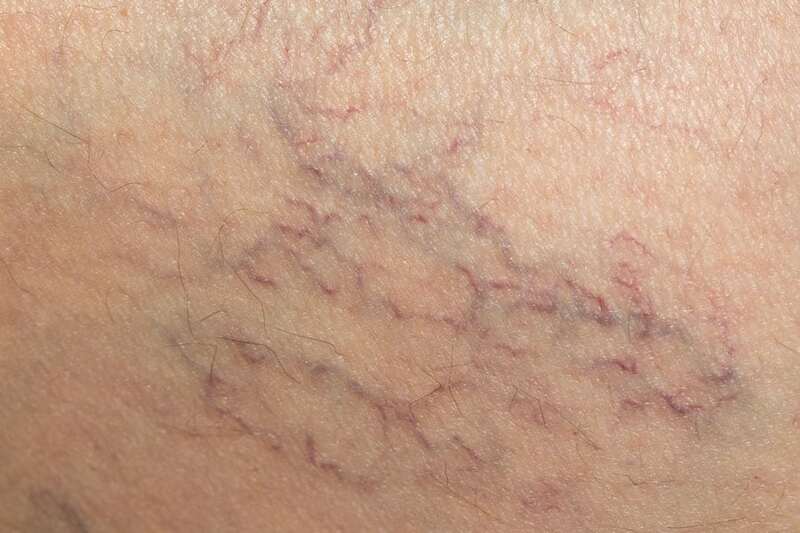 Spider veins are clusters of red, blue, or purple veins that often appear on the legs and the face. They can appear at any time throughout your life. Spider veins are treatable. During an initial consultation with your board-certified dermatologist at Aesthetic & Dermatology Center, you and your dermatologist will discuss any pain you’re experiencing, your health and family health history, and your aesthetic goals. Your board-certified dermatologist will thoroughly examine your spider veins in order to design a personalized treatment plan optimized to help you reach your goals. The treatment plan your provider creates will depend upon the location of your spider veins. Scelerotherapy is an injectable glycerin treatment for spider and varicose veins. At Aesthetic & Dermatology Center, scelerotherapy is used to approve the appearance of your skin and diminish the appearance of spider veins. During this procedure, your legs will be elevated, and your provider will inject the saline solution into your vein. The number of injections that you receive depends on the number of veins that you are having treated. After the procedure is completed, you will be allowed to stand up and walk. Walking is essential to prevent blood clots. Oftentimes, you will be able to resume normal activity on the same day as the procedure. Generally, you can expect to see results in 3-6 weeks. After a follow-up examination, you and your dermatologist will determine whether you will need future treatments. The VBeam® pulsed dye laser utilizes light energy that targets the spider veins. The energy that is emitted by the VBeam® pulsed dye laser is absorbed by your spider veins, causing them to collapse. Your body’s natural healing response will then reabsorb the veins. If there is any discomfort, it will only be mild. The length of time your treatment takes will depend upon the area and size of the area that you are treating. Results can generally be seen immediately after treatment. However, your board-certified dermatologist will be able to give you realistic expectations depending on your skin type, and the area that you’re treating. To talk to your board-certified dermatologist about how one of these painless procedure can give your skin the vein-free appearance you’ve been looking for, call our office today at (301) 610-0663 or request an appointment online. Click to enlarge or zoom up on image.